Assembling whilst still at college in Dublin a mere three years ago, from the ruins of early nowhere bands, and having discovered a shared love of poetry and a common zeal for authentic self-expression, the evolution of Fontaines D.C. has been swift, sure and seemingly effortless. Over the last year, Fontaines D.C. have released four acclaimed AA side singles, all of which garnered support both from radio, with the band A-listed at BBC Radio 6 Music for their last single, Too Real. Through around 200 dates in the UK, Europe, and the US, one word has kept resurfacing in their characteristically eloquent yet direct interviews: authenticity. "I think there's an authenticity to what we do, and people have been starved of authenticity for too long," said the band's lead vocalist Grian Chatten. Not youthful bravado, but a truthful reflection of the shared code that has guided these five young best friends thus far, with what has occasionally seemed a preternatural combination of insouciance and self-belief. This commitment to the authentic, in their music and in each other, is key to understanding the Fontaines D.C. aesthetic. "In the course of "going round bars, drinking and writing poetry and romanticizing it to bits," according to bassist Conor Deegan, the band pushed each other to create, always keeping a collective eye on keeping it real. "We'd call each other out" Chatten explained, adding, "through each other, we found ourselves a lot quicker." Alongside this commitment to each other and the shared goal, another overarching formative dynamic was at work: Dublin City itself; more specifically, the disappearing Dublin embodied most readily in their immediate surroundings, the old working class neighborhood known as The Liberties. As with so many of our cities, the modern malaise of gentrification is steadily claiming vast swathes of the Irish capital. Sure, that's progress, but the underlying cultural cost of this air-brushing of an environment is something that has preoccupied Chatten, feeding into much of the Fontaines' lyrical content, and indeed the early singles' artwork which featured long-gone, semi-mythical figures like Bang Bang and Forty Coats, real-life quasi-Dickensian characters, legendary in their own time but now becoming lost in the city's fading folklore. Chatten speaks of writing about "the dying romance of the city...the reason we love the Liberties is that seems to be where a lot of that action is happening." As Lou Reed did with New York, or Ray Davies with London, or indeed The Smiths with Manchester - write what you know, as the old advice goes - or, in the words of guitarist Conor Curley: "From talking to these guys about literature, I saw Irishness as being easily romantic about what you see." It's a through-line that can be discovered in all the best of Irish art, whichever the medium, and the band's intent is drolly embodied in the album's knowing title: Dogrel. To give it its dictionary definition (or close enough for now): crude verse of little artistic worth. The ribald rhymes of the docks, the factories and the early houses. The authentic poetry of the people, which any smart Irish poet knows it is foolish to think oneself above. For in it all is an ineffable beauty, something these young men understand very well. Reluctant to be viewed as part of any wider movement ("I get a bit uncomfortable with some of the comparisons that have been made," says Chatten, as he must, though they inevitably shall be) Fontaines D.C. have delivered on their tremendous promise in a way that few bands have. It is to their credit and it augurs well that their collective eye is already on the next phase as they prepare for now to merely take on the world for real. Too real. 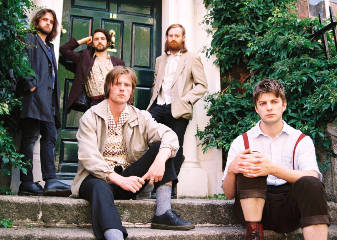 Fontaines D.C. play The Haunt, Brighton, on Thursday 18th April 2019. New album 'Dogrel' is out now. For more info CLICK HERE.